Athens is considered one of Europe's safest capitals and has a user-friendly transportation network. Thanks to its rich morphology Athens has plenty of places where you can admire breathtaking and panoramic views of the city. Surrounded by a lining of stunning seas and mountains, Athens offers a plethora of adventurous opportunities just waiting to be discovered. Located at the crossroads of three continents, the capital of Greece has often been the hub of many cultures. Characterized by a culture and people that are warm and hospitable, every visitor feels welcome. Athens is an ideal congress destination, combining state-of-the-art infrastructure, excellent conference facilities and easy access from all over the world with world-class cultural attractions, modern amenities, diverse entertainment and natural beauty. Boasting a history of 2.500 years with monuments incorporated into the modern city, coupled with world class museums and a vibrant contemporary cultural life, Athens is a very attractive destination. 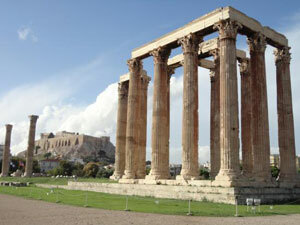 The establishment of Athens as a city dates back to mythological times. Despite the length of the city’s history, it is still evident throughout Athens in the form of many ancient, Roman, Byzantine and Modern monuments. A center for the arts, learning and philosophy, home of Plato’s Academy and Aristotle’s Lyceum, Athens was also the birthplace of Socrates, Pericles, Sophocles and its many other prominent philosophers, writers and politicians of the ancient world. It is widely referred to as the cradle of Western civilization and the birthplace of democracy, largely due to the impact of its cultural and political achievements during the 5th and 4th centuries BC on the rest of the, then known, European continent. The heritage of the classical era is still evident in the city, represented by a number of ancient monuments and works of art, the most famous of all being the Parthenon on the Acropolis, widely considered a key landmark of early Western civilization. The city also retains a vast variety of Roman and Byzantine monuments, as well as a smaller number of remaining Ottoman monuments projecting the city’s long history across the centuries. Landmarks of the modern era are also present, dating back to 1830 (the establishment of the independent Greek state), and taking in the Greek Parliament (19th century) and the Athens Trilogy (Library, University, and Academy). 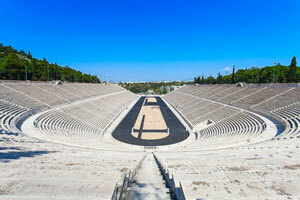 Athens was the host city of the first modern-day Olympic Games in 1896. Having hosted the 2004 Olympic Games, Athens can evidently meet the requirements of the most demanding of events, always delivering an impeccable result. Today’s capital is a result of integration of ancient and medieval history into the contemporary era. The official language is Greek. English are widely spoken and understood. English is the ICIP 2018 official language. Athens is at UTC/GMT +3 hours during the summer/autumn period. The electrical power supply “voltage” in Athens is: 220-240 Volts (U.S./Canada: 110-120 Volts). There are 4 main GSM operators in Greece that you can roam with: Cosmote, Vodafone, Wind and CYTA. The protocols for digital mobile telephone transmissions are based on GSM technology, operating at the frequencies of 900 and 1800 MHz. Please contact your provider for further details. Euro (€) is the official currency. Banks’ working hours: Monday-Thursday from 08:00–14:30 and Friday from 08:00–14:00. In restaurants and hotels, taxis or other services, tipping is optional and customized per case depending on whether you are pleased with the service. Approximately 10% of the bill is a good guideline. Athens enjoys a warm Mediterranean climate and ample sunshine. The average temperature during the month of October is 16°C to 22°C / from 61° F to 72° F.
Being one of the most historically significant cities is Europe Athens has much to offer to those who are interested in exploring some of the routes of our world’s civilization. Over the years, a multitude of conquerors occupied Athens, and erected unique and truly splendid monuments. Today’s capital integrates the ancient and medieval history into the contemporary era. Monuments can be found all around the city center, side by side with contemporary constructions such as buildings, roads and train stations. 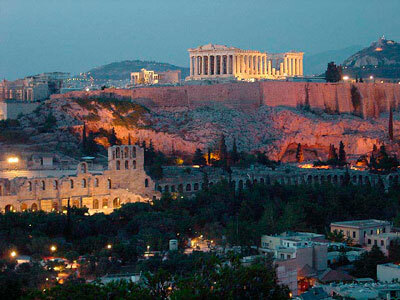 The Acropolis is the strongest and most important monument of Ancient Greek civilization. The main building, Parthenon was dedicated to Athena Parthenos, the patron Goddess of the city and was completed in 432 BC. Unique in its beauty, like all ancient monuments is has suffered destruction and theft, but thankfully just under the hill where the monument stands in, there is the Acropolis Museum providing all the missing pieces of information needed for someone to understand its significance and all the stories it has played a role in throughout the years. 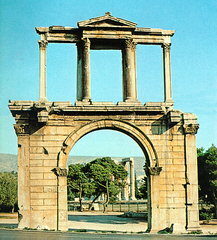 Before starting the climb to get the Parthenon, it is impossible to miss a monument as impressive as Hadrian’s Arch. Constructed in 131 AD by the Roman Emperor, it was created to form an entrance for the new city and separate it from the old one. From the side of the monument that faces the Acropolis one can see the inscription “This is Athens, the former city of Theseus” while on the other side “This is the city of Hadrian and not of Theseus”. Behind Hadrian’s Arch, stands the captivating temple of Olympian Zeus. The building process started in the 6th century by Peisistratos and was finally finished 100 years later in 131 AD by Emperor Hadrian. Originally it consisted of 104 Corinthian columns of which only 15 remain standing today. Inside the temple, Hadrian built an enormous gold and ivory statue of Zeus and an equal one of himself. To this day we do not know when the temple was destroyed but like many other large buildings in Greece, it is possible that it was brought down by an earthquake during the mediaeval period and the ruins sold for other building materials. The Ancient Agora, which means “market” in modern Greek, is situated at the footsteps of the Acropolis and in ancient times it served as the commercial centre of the city but also as a political, cultural and religious centre. Today it resembles a park and is a peaceful area that can be explored either on foot or by bicycle giving people a vivid visual of the everyday life of an ancient Athenian. Originally built in the 4th century B.C. for the athletic competitions of the Great Panathinaia (ancient Greek festivities), the “Kallimarmaron” Stadium was the venue of the first modern Olympic Games, in 1896. A creation of the Athenians, as its name proudly proclaims, the Panathenaic Stadium has been the venue for noble competition and fair play, of mind and of body, since Antiquity. Built at the base of the Acropolis, the ancient amphitheatre of Herodeion, also known as the Odeon of Herodus Atticus, is one of the best places to experience a live classical theatre performance. This ancient theater was built in the Roman times, in about 161 A.D. by the Roman philosopher, teacher and politician Herodes Atticus. 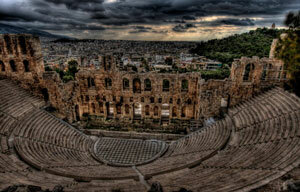 It was built in the memory of his wife Aspasia Regilla who died in 160 AD and is still used for various performances. The National Archaeological Museum of Athens is the largest in Greece and one of the most important museums in the world devoted to ancient Greek art. It was founded at the end of the 19th century to house and protect antiquities from all over Greece, thus displaying their historical, cultural and artistic value. The Acropolis Museum was founded in 2003 and completed in 2007 after decades of being born as an idea, as a place that would accommodate the missing Parthenon sculptures. Today it is focused on the findings of the archaeological site of the Acropolis of Athens. The museum was built to house every artifact found on the rock and on the surrounding slopes, from the Greek Bronze Age to Roman and Byzantine Greece. It also lies over the ruins of a part of Roman and early Byzantine Athens. The Byzantine and Christian Museum, which is based in Athens, is one of Greece’s national museums. Its areas of competency are centered on – but not limited to – religious artefacts of the Early Christian, Byzantine, Medieval, post-Byzantine and later periods. The Museum has over 25.000 artifacts in its possession, which date from between the 3rd and 20th Century A.D. The Museum of Cycladic Art is dedicated to the study and promotion of ancient cultures of the Aegean and Cyprus, with special emphasis on Cycladic Art of the 3rd millennium BC. It was founded in 1986, to house the collection of Nicholas and Dolly Goulandris, an extensive and unique private collection of prehistoric art from the Cycladic islands as well as ancient Greece. The Benaki Museum ranks among the major institutions that have enriched the material assets of the Greek state. It houses 30.000 items illustrating the character of the Greek world through a spectacular historical panorama covering several periods ranging from the Prehistoric, Ancient and Roman periods to the Byzantine and the contemporary Hellenic period. A living museum, an ultramodern cultural center, where visitors can learn about history, culture and sciences through interactive exhibitions, educational programs, virtual reality shows and documentaries. Greek gastronomy has recorded a history of around 4,000 years, with especial characteristics based on pure and unique quality goods produced on Greek soil. In fact, it was Archestratos who wrote the first cookbook in history (330 B.C.). In truth Greek cuisine has four secrets: good quality fresh ingredients, correct use of flavorings (herbs) and spices, the famous Greek olive oil and simplicity. Olive oil, honey, salt and cheese may be the signature tastes one remembers after having a meal here but there are many more ways to impress your palette and satisfy your cravings. Due to the ever generous Mediterranean sea, a Greek table is almost never complete without various delicious fresh fish. Finally when it comes to drinking, wine has been imbedded in the Greek culture since the ancient times and is still taken and drunk very seriously by Greeks today as there are hundreds of wineries around the country and countless wine bars in all cities and islands. Other famous Greek drinks include Ouzo, Raki and the mysterious Mastic that can only be produced in one island in Greece as the plants of its origin are unable to grow successfully anywhere else in the entire world for reasons still unknown to this day. One of the main characteristics of Greek Culture tourists notice is the vibrant lifestyle and unique hospitality of Athenians. From jazz bars to pubs and the clubs to the traditional Greek Bouzoukia, Athens is a vibrant city offering a wide range of options that appeal to all sorts of lifestyles and tastes. Dinner in Greece is served relatively late compared to other countries, reservations are rarely booked before 9 pm and bars never close before 2 am. Clubs in Athens can stay open until the morning hours making every night into a special occasion where one can meet new people, as Greeks have a tendency to meet, greet and include people when they are having fun. As a night starter, Greece is one of the few countries in Europe where all cinemas play films in their original language with complimentary subtitles, therefore allowing our visitors to enjoy the pleasure of a movie the same way they would at home country.